This article is about the country. For other uses, see Armenia (disambiguation). "Hayastan" and "Hayasdan" redirect here. For other uses, see Hayastan (disambiguation). Armenia (/ɑːrˈmiːniə/ ( listen); Armenian: Հայաստան, translit. Hayastan, IPA: [hɑjɑsˈtɑn]), officially the Republic of Armenia (Armenian: Հայաստանի Հանրապետություն, translit. 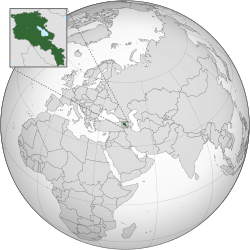 Hayastani Hanrapetut'yun, IPA: [hɑjɑstɑˈni hɑnɾɑpɛtutʰˈjun]), is a country in the South Caucasus region of Eurasia. 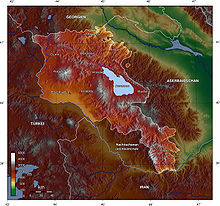 Located in Western Asia on the Armenian Highlands, it is bordered by Turkey to the west, Georgia to the north, the de facto independent Republic of Artsakh and Azerbaijan to the east, and Iran and Azerbaijan's exclave of Nakhchivan to the south. Bronze Age burial site Zorats Karer (also known as Karahunj). 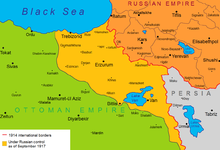 The greatest extent of the Russian occupation of Turkish Armenia during WWI, September 1917. Armenians gather at Theater Square in central Yerevan to claim unification of Nagorno-Karabakh Autonomous Oblast with the Armenian SSR. As it enters the 21st century, Armenia faces many hardships. It has made a full switch to a market economy. One study ranks it the 41st most "economically free" nation in the world, as of 2014[update]. 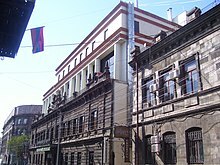 Its relations with Europe, the Middle East, and the Commonwealth of Independent States have allowed Armenia to increase trade. Gas, oil, and other supplies come through two vital routes: Iran and Georgia. Armenia maintains cordial relations with both countries. Carbon dioxide emissions in metric tons per capita in Armenia, Azerbaijan, Georgia, Russia, Germany, Italy, USA in 2000–2012. 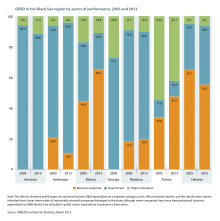 World Bank data. Armenia is also a member of the Council of Europe, maintaining friendly relations with the European Union, especially with its member states such as France and Greece. 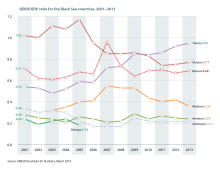 A 2005 survey reported that 64% of Armenia's population would be in favour of joining the EU. Several Armenian officials have also expressed the desire for their country to eventually become an EU member state, some[who?] predicting that it will make an official bid for membership in a few years. In 2004 its forces joined KFOR, a NATO-led international force in Kosovo. It is also an observer member of the Eurasian Economic Community and the Non-Aligned Movement. As a result of its historical ties to France, Armenia was selected to host the biennial Francophonie summit in 2018. 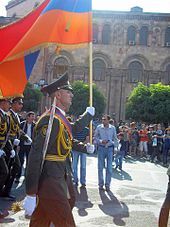 A former republic of the Soviet Union, Armenia is an emerging democracy and as of 2011[update] was negotiating with the European Union to become an associate partner. Legally speaking, it has the right to be considered as a prospective EU member provided it meets necessary standards and criteria, although officially such a plan does not exist in Brussels. 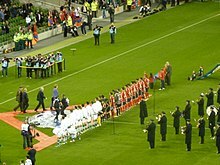 The Government of Armenia, however, has joined the Customs Union of Belarus, Kazakhstan and Russia and the Eurasian Economic Union. 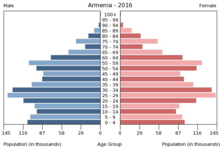 Human rights in Armenia tend to be better than those in most former Soviet republics and have drawn closer to acceptable standards, especially economically. Nonetheless, there are still several considerable problems. Within each province there are communities (hamaynkner, singular hamaynk). Each community is self-governing and consists of one or more settlements (bnakavayrer, singular bnakavayr). Settlements are classified as either towns (kaghakner, singular kaghak) or villages (gyugher, singular gyugh). As of 2007[update], Armenia includes 915 communities, of which 49 are considered urban and 866 are considered rural. The capital, Yerevan, also has the status of a community. Additionally, Yerevan is divided into twelve semi-autonomous districts. Yerevan is the economic and cultural centre of Armenia. Historical and modern distribution of Armenians. Ethnic Armenians make up 98.1% of the population. Yazidis make up 1.2%, and Russians 0.4%. 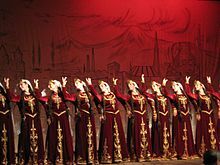 Other minorities include Assyrians, Ukrainians, Greeks (usually called Caucasus Greeks), Kurds, Georgians, Belarusians, and Jews. There are also smaller communities of Vlachs, Mordvins, Ossetians, Udis, and Tats. Minorities of Poles and Caucasus Germans also exist though they are heavily Russified. As of 2016[update], there are an estimated 35,000 Yazidis in Armenia. The 7th-century Khor Virap monastery in the shadow of Mount Ararat, the peak on which Noah's Ark is said to have landed during the biblical flood. The Yazidis, who live in the western part of the country, practice Yazidism. As of 2016[update], the world's largest Yazidi temple is under construction in the small village of Aknalish. There are also Kurds who practice Sunni Islam. 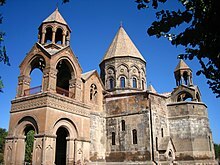 This page is based on the Wikipedia article Armenia; it is used under the Creative Commons Attribution-ShareAlike 3.0 Unported License (CC-BY-SA). You may redistribute it, verbatim or modified, providing that you comply with the terms of the CC-BY-SA.